After making the first three tier cake I had to play with it some more. Typical tiered wedding cakes have columns between the layers and of course something on top of them. 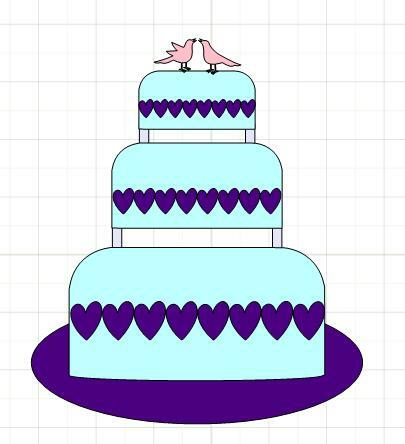 Well I couldn't make a bride and groom but did find a really cute pair of birds to put on the top. I have not tried cutting this yet but thought it too cute to not share with others. I hope you enjoy it. If you use it in a layout or card I would love to see it or any of my other files. Thanks for stopping by, have a great day! Thank you so much for this post. I want to let you know that I posted a link to your blog in Creative Busy Hands Cricut Freebies Search List, under the Wedding, Birthday/Party Theme(s), Mardi Gras/Carnaval Theme post on Jun. 24, 2010. Thanks again.